Warm ocean waters fuel hurricanes. The Gulf of Mexico was about 2 degrees F. (1 deg. 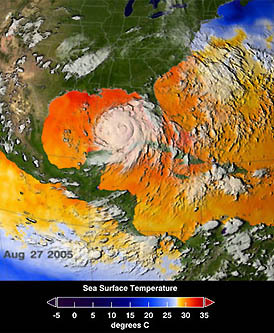 C.) warmer than normal when Katrina, imaged above, went from a Category 1 to Cat 5 between August 26 and August 28, 2005, before slamming into the Gulf Coast as a Category 4 on August 29, 2005. Image courtesy NASA. October 7, 2005 Princeton, New Jersey – This week a research scientist at NOAA’s Climate Diagnostics Center at the University of Colorado in Boulder, talked to me about the latest Atlantic Ocean surface temperatures he has analyzed. Dr. Klaus Wolter told me that in August 2005, before Hurricane Katrina hit land on August 29, the Gulf of Mexico sea surface temperatures were the warmest on record going back a hundred years. Think of a football field and turn it on end down into the water. A huge area was 79 degrees F. all the way down 150 meters just west of Florida and the Keys. That’s what gave Katrina its intensity and what allowed Rita to become so strong, so quickly just three weeks later (Sept. 20 when it first hit the Florida Keys). According to research published in the September 16th issue of the journal Science by Prof. Peter Webster at Georgia Tech’s School of Earth and Atmospheric Sciences, the number of Category 4 and 5 hurricanes around the world in 6 ocean basins has almost doubled since 1990. The number of Category 4 and 5 hurricanes worldwide has nearly doubled over the past 15 years. Image courtesy Peter Webster/Georgia Tech. Further, in the August 4th journal, Nature, MIT atmospheric physicist, Dr. Kerry Emmanuel, reported that the power of hurricanes has increased over the past 30 years. His data on hurricane winds and duration show that the destructive power of North Atlantic storm damage has nearly doubled since the mid-1970s. Dr. Emanuel also found for northwest Pacific storms, what he calls the “Power Dissipation Index,” increased about 75%. He attributes the sharp jump to increases in storm duration as well as much larger than expected increases in wind power. 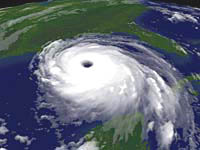 NOAA Hurricane Katrina regional imagery, August 28, 2005. Another scientist who works with computer climate models is Thomas Knutson, M. S., a research meteorologist at NOAA’s Geophysical Fluid Dynamics Laboratory in Princeton, New Jersey. Mr. Knutson sees evidence that global warming of sea surface temperatures might be equally as important now in hurricane intensities as the natural cycle known as the Atlantic Multi-Decadal Oscillation. Thomas Knutson, M. S., Research Meteorologist, NOAA’s Geophysical Fluid Dynamics Laboratory, Princeton, New Jersey: “First of all, globally 2005 is going to be one of the warmest years on record, if not THE warmest year on record globally. We’re not through the year yet, but that’s the way it’s shaping up so far. If you look in the main development region in the tropical Atlantic, sea surface temperatures have been quite warm all summer ­ perhaps 1 to 1.5 degrees Celsius (2 plus degrees F.) above the normals for that region. I’ve also looked in that region using ten year averages for temperatures in that region and looked at those going back into the late 1800s. The current ten year average in that region is higher than anything else in the record. So we are at unprecedented high levels in terms of ten years average temperatures in this main development region of the Tropical Atlantic. DOES THAT MEAN THAT KATRINA, WHICH WAS SO STRONG, FOLLOWED BY RITA, AND THE FOUR HURRICANES LAST YEAR ­ THAT THIS AN INTRODUCTION TO A NEW INTENSITY OF HURRICANES? One thing we believe is going on in the Atlantic Basin in particular is an oscillation known as the Atlantic Multi-Decadal Oscillation, where sea surface temperatures and other conditions in the basin fluctuate on a time scale of several decades. However, our analysis of temperatures in that basin indicate that in addition to this Atlantic Multi-Decadal Oscillation, there also appears to be an underlying warming trend that’s going on. So, the two things together are operating. These very high temperatures we have now are, according to this interpretation, are a combination of a warm phase of the Atlantic Multi-Decadal Oscillation and this underlying warming trend, which appears to be rather similar to the global average of warming trends. More Katrinas In the Future? IF THERE HAS BEEN A GENERAL TREND UPWARD FOR 50 YEARS AND WE’RE LOOKING INTO THE 21ST CENTURY WITH COMPUTER WEATHER MODELS THAT ARE INDICATING THAT CO2 IS GOING TO CONTINUE TO THICKEN AND THERE WILL BE RISING TEMPERATURES ­ IS THE INTUITIVE CONCLUSION THAT THEREFORE HURRICANES WILL INEVITABLY BECOME STRONGER AND THERE WILL BE THE POTENTIAL FOR MORE KATRINAS A VALID CONCLUSION? Well, we do believe that hurricane intensities are going to increase. But the question is: how much are they going to increase? That’s a very difficult research question at this time. The suggestion from the MIT Emmanuel study is that the rate of increase in the past 50 years or so has been quite dramatic. A second study came out just a few weeks ago in the journal, Science, and Prof. Peter Webster was the lead on that study with three co-authors. They found that when they looked at the number of hurricanes in various categories occurring in the different basins around the world ­ they are called typhoons in some other basins. 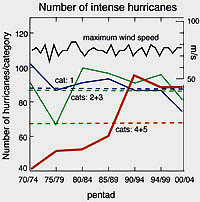 The data shows between 1990 and 2005 that the number of Category 4 and 5 hurricanes in all six basins (of the world) increased, roughly doubling in number over that time. So this is a second piece of observational evidence suggesting an increase, and a fairly strong increase, in the intensity of hurricanes which is concurrent with sea surface temperature warming in those basins. IF HURRICANES IN THE SIZES OF 4 AND 5 HAVE BEEN INCREASING IN ALL SIX BASINS OF THE WORLD, DOESN’T IT RAISE A BIG RED FLAG ABOUT WHAT THE FUTURE MAY BRING AND HOW GOVERNMENTS COULD CONTINUE TO SUSTAIN PAYING FOR $200 BILLION DAMAGE HURRICANES EVERY YEAR? The study showing the increase in Categories 4 and 5 in all basins (of the world), that study has also been criticized by some which think the data back in the earlier part of the record is not reliable enough to draw the conclusions that were drawn. So, I think there is going to be a healthy debate going on between those who study the hurricane observations to try to come to more of a consensus on whether these very rapid trends ­ frankly, somewhat alarming trends showing up in the intensity measures are real or not. But there is at least a possibility that they are, so I think these studies need to be taken seriously and more study needs to be done to understand what’s going on here. IF THE ALARMING TREND PERSISTS, WHAT DO YOU THINK THE WORST CASE COULD BE? One aspect of the global climate change problem that people need to keep in mind is that it’s a problem with very long time scales. Once the Earth warms in response to greenhouse gases, the time scales in the climate system are so large that one should not expect us to be able to return things to sort of pre-warmed state in a short period of time. It’s a very long time scale. AND HURRICANES COULD, INSTEAD OF BEING ON A CYCLE, COULD BE INTENSE FOR A LONG TIME? 1) Ethel, 1960 – Only 18 hours from tropical storm to hurricane.